Nobody ran the table Sunday when members of the Hollywood Foreign Press Association gathered in the The Beverly Hilton Sunday night to give the the Golden Globe awards for the 74th time. As usual, many in the entertainment world are hoping to find glimpse of the future in the Globes crystal Oscar ball. Will it happen? We won’t know until February. Until then it was a night for the elite of Hollywood to drink, laugh and show off in front of each other. La La Land and Donald Glover came as close to dominating the night as anyone. We have a complete list of winners below. But first, let’s run down the opening of the show. Hosted by Tonight Show host Jimmy Fallon, the night started of course with the red carpet. Seven days of rich people wearing fancy clothes and talking to entertainment reporters. OK, maybe not seven days, but it was a while. The show proper started with a La La Land homage. Jimmy Fallon started off singing in a limo waiting to get to the red carpet. He was then joined in song by nominees singing in the street. 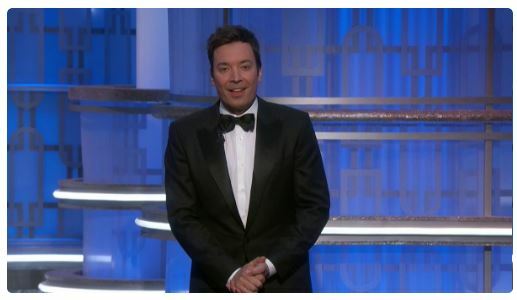 Among many movie and TV references Jimmy made his way to the Globes stage. Two highlight: ‎Rami Malek as his Mr. Robot character confronting Jimmy with some comprising pictures; and the rap breakdown by the Stranger Things kids. Oh, and Barb is alive in case you didn’t know, or care. The open then cut to Jimmy backstage on piano joined by Ryan Reynolds lounging on the top of the instrument. They shared a mint and Jimmy sang about the “Room Full of Stars.” Next Tina Fey was there, no longer extorting walnuts from airplane passengers, she tried to confess her love for Jimmy, but Jimmy only has eyes for Justin. Timberlake takes Jimmy up an magical staircase to the clouds where they dance. Then JT makes fun of Jimmy and ushers him onto the stage. The monologue started with a malfunctioning teleprompter, prompting Jimmy to vamp with several exclamations about how crazy the evening will be, you know drunk stars and all. Tech got fixed quick, much to Mariah’s chagrin, and the jokes started with a fine popular vote jab. Then Fallon went to the audience shout-out portion of the monologue which included a bit about Ryan Gosling’s pianist and an odd Chris Rock. After a few more jokes and shout-outs to Jeff Bazos and Matt Damon the awards began. Ben Kuhns is a writer, audio producer and minor local celebrity. He’s an aging nerd, who loves comedy, sci-fi, music, hot sauce and free stuff (hint hint).